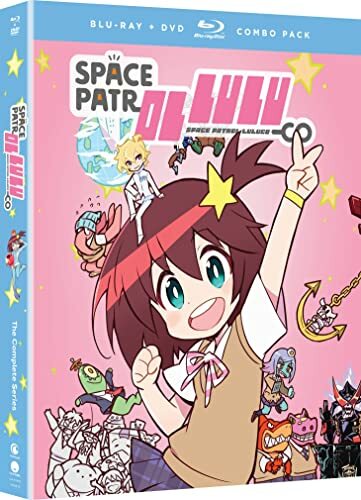 Space Patrol Luluco: The Complete Series - BUY THIS BLU-RAY! Her hometown is full of aliens, her dad is a space patrolman, and her body turns into a gun at the sight of evil. She’s Luluco, and she just wants to be normal. Well that’s too friggin’ bad! Now that her dad’s been frozen in a block of ice, there’s only one way for this middle schooler to pay for the treatment—by taking his place in the Space Patrol. It’s a total pain, until she gets partnered with some perfect crush material, a.k.a. the handsome Nova from outer space. Sounds like a trashy teenage first-love story, right? You bet it is! After a run-in with a black hole app designed for shoplifting, all hell breaks loose. Her hometown of Ogikubo gets sucked into space, and now it’s up to Luluco and a bunch of weirdos to track it down. Through it all, she’ll learn an epic lesson—normal is something we decide for ourselves. THEN SEND IN A COMMENT ABOUT YOUR FAVORITE FUNIMATION TITLE (you may click on artwork above for a refresher) PLUS YOUR NAME AND ADDRESS TO contests@efilmcritic.com or WeLoveHBS@aol.com. (Just one e-mail please.) Put [b]"CALL SPACE PATROL LULUCO" in the subject line and cross your fingers. We will draw names and one of the prizes could be yours. Only 1 entry per household.